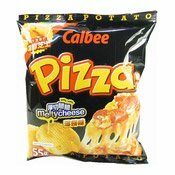 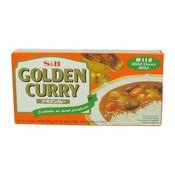 Allergy Advice: Contains Wheat, Soybean, Milk, Sesame. 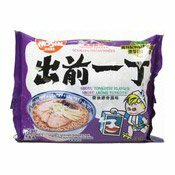 Ingredients: Noodles: Wheat Flour, Palm Oil, Tapioca Starch, Salt, Sodium Hexametaphosphate, Potassium Carbonate, Sodium Tripolyphosphate, Sodium Carbonate, Dextrin, Sodium Alginate, Guar Gum, Sodium Dihydrogen Phosphate, Disodium Hydrogen Phosphate, Tocopherol, Tetrasodium Pyrophosphate, Ascorbyl Palmitate, Green Tea Powder. 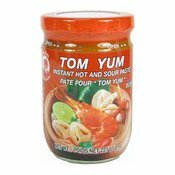 Soup Base: Salt, Monosodium Glutamate, Glucose Syrup, Sugar, Hydrolysed Soy Protein, Yeast Extract, Soy Sauce Powder (Soybean, Wheat, Salt), Garlic Powder, Hydrogenated Palm Oil, Onion Powder, Dehydrated Green Onion, Disodium Guanylate, Disodium Inosinate, Black Pepper Powder, Ginger Powder, Guar Gum, Maltodextrin, Rice Oil, Milk Protein, Silicon Dioxide. 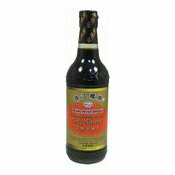 Black Garlic Oil (2.7g): Palm Oil, Garlic, Sesame Oil, Caramel Colour. 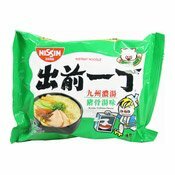 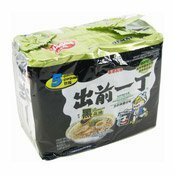 Simply enter your details below and we will send you an e-mail when “Instant Noodles Multipack (Black Garlic Oil & Artificial Pork) (出前一丁黑蒜油豬骨麵)” is back in stock!